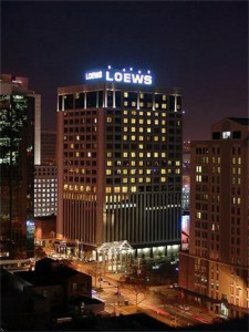 Loews New Orleans the newest luxury hotel in New Orleans. Ideal Central Downtown location in the Arts District. 3 blocks to French Quarter, Convention Center/ museums/ Cruise Ship Terminal/ Riverfront/St. Charles Avenue Streetcar/ Aquarium/ shopping. Across from Harrah's Casino. 7 blocks to National D-day Museum and Ogden Museum of Southern Art. 9 blocks to Superdome and New Orleans Arena. Magnificent guestrooms with 10ft ceilings and large windows through which guests can capture the expansive views of either the Mississippi river, the New Orleans skyline, arts district, or piazza d Italia. Cafe Adelaide and the swizzle stick lounge add to the hotels theme of get ready for a little mischief and a lot of style.